SPS does create a reliable barrier between your face and your patient against the transfer of body fluids and particles. Not as protective as ViVi or OXYGEN Aerolyte, its low weight and high level of comfort makes it a perfect alternative. 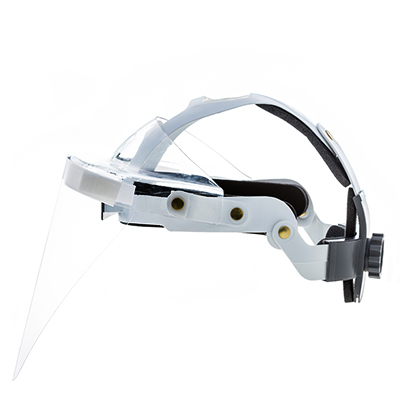 The patented re-usable head belt allows for single-hand adjustment and is easy to clean. Our comfort pads are replaceable for your convenience. Body fluids and particles bouncing off the face shield can increase the risk of infection for the patient. Our sterile faceshield helps to reduce this risk. It is made from a high performance polycarbonate with glare-free surface properties. Our head belt is reusable and available in two sizes. Replace comfort pads at your convenience. The sterile faceshield is easy to mount.